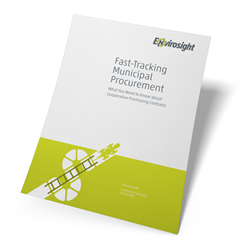 Envirosight Publishes New White Paper, "Fast-Tracking Municipal Procurement"
Envirosight publishes a new white paper on the benefits of cooperative contract purchasing for municipal procurement. Cooperative contracts streamline the procurement process by eliminating the need for competitive bidding on the part of municipalities. With budgets under pressure, it is essential that municipalities look for innovative ways to do more with less. Cooperative purchasing accomplishes just that. In a new white paper, Envirosight reveals the benefits of cooperative purchasing contracts and lays out how to get started.